This winter has been unseasonably warm, but also immensely gloomy. Our weeks have been filled with grey days and rain. When you add that to the shortened daylight hours it can be a little much. Our livingroom has four floor to ceiling walls, but with neighbors all around our floor to ceiling windows stay covered with floor to ceiling blinds. I’ve mourned the natural light I could have (but don’t) especially during these gloomy seasons. Finally I’ve thought of a way to block people’s view into my home while enjoying the natural light. As a bonus it adds color and interest to the room as well! You often see these stars associated with Waldorf schools. They use kite paper, which is a beautiful, thick, colored wax paper. I didn’t have any kite paper on hand, but I did have some tissue paper from the dollar store, which worked surprisingly well. The only other tools you need are a glue stick and scissor or a rotar cutter. 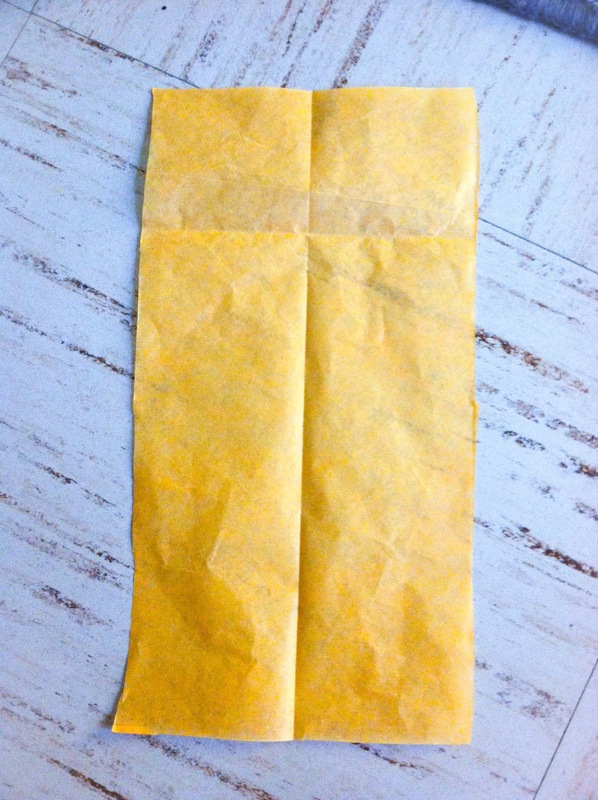 Start by folding your tissue in half and cutting along the fold. Do this until you have 8 pieces that are all the same size. I prefer the way the star looks if your pieces are rectangles, but it will work if they’re squares as well. Next fold a piece in half the long way. 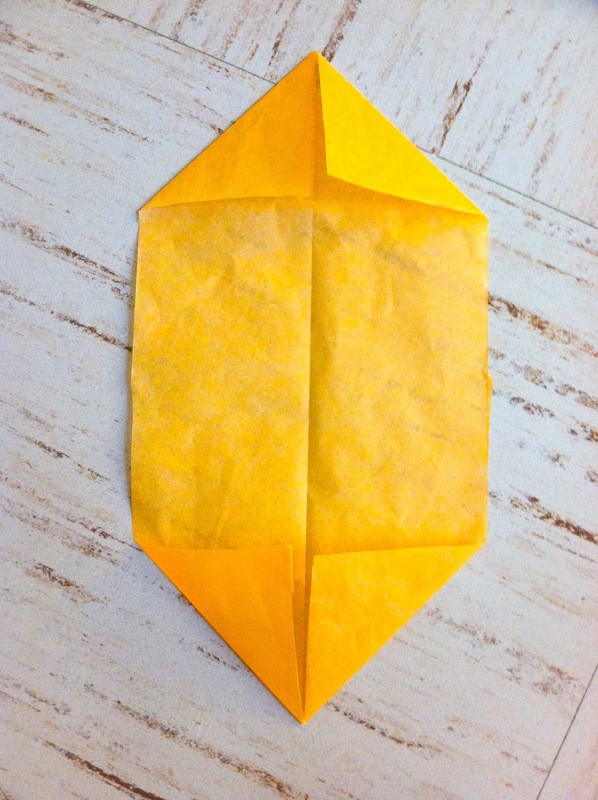 Then fold all of the corners towards the center. At the top, fold both sides in towards the center again (the picture is of one side done). Do that to all 8 pieces. I attached mine with the folds against the window so they would stay nice and flat. I applied a small amount of glue to both points to adhere it to the window. I placed my first one with the top pointing towards the ceiling. Then I line up the bottom folded edge of the next piece with the center fold on the first. I do that all the way around, making sure the bottom points all meet in the center. Ta da! So bright and cheery! 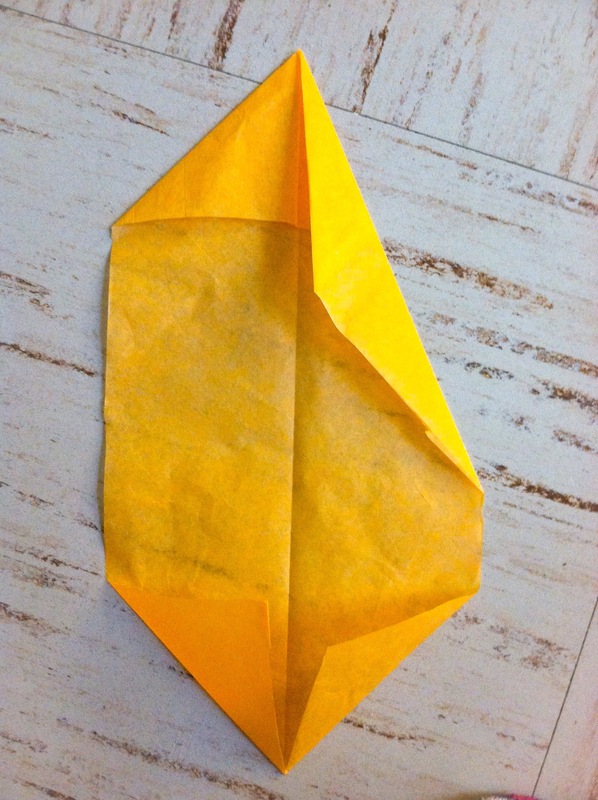 This would be really fun to do with kids elementary age or older and would be a great introduction to origami! 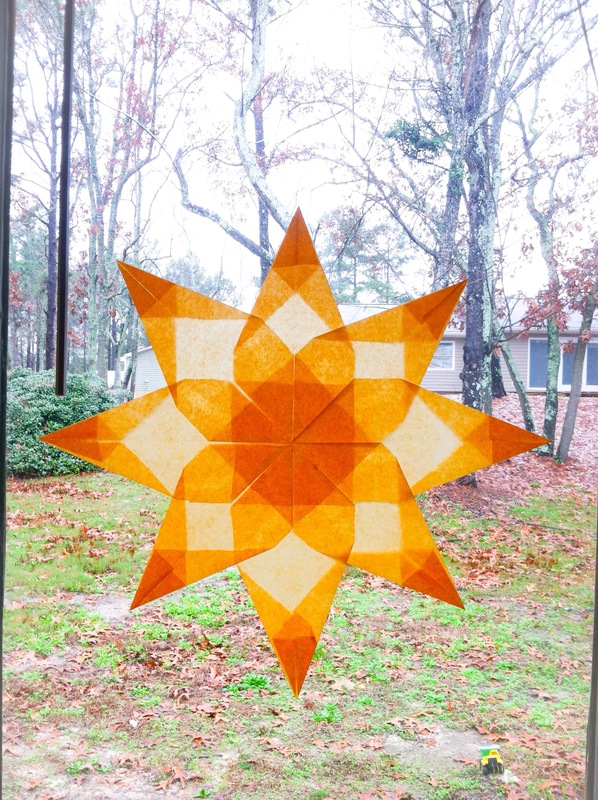 You can use any color tissue you like and experiment with using more then one color within a star. You can also change the size of the star by using different sized paper. Let me know what combinations you come up with! I’ll post more pictures once I get my windows done. First of all, I’m sorry I haven’t been as active lately. I’ve been exhausted and we’ve been busy *insert list of excuses here*. But I’m here now, and happy to be. Fall cleaning, is that a thing? Maybe I should live in Australia because I’m doing spring cleaning at the wrong time of the year. Or is it? Why wouldn’t we want to organize and clean our homes going into the season where we spend the most time inside (winter)? It’s amazing how stuff can really weigh you down. I’ve always been a collector. But maybe I’m growing out of that. All of the time, money and effort that goes into acquiring and maintaining STUFF. It feels like such a waste. And the clutter around my house drives me crazy. I watched a really inspiring documentary about the “tiny house” movement. The overwhelming message I got from it was we only have so much time. Why spend it working at a job you hate to acquire houses and stuff that you don’t have time to enjoy because you’re always working? I’d much rather spend time with my family. My husband works really really hard and just maybe, someday, he can relax and spend more time with us. If we get less stuff now, and save more money. If we truly think about each purchase. If we invest in quality that will last. If OUR American dream is to have less debt, more peace of mind and spend more time together. So here is the beginning of the road for me. Honestly our apartment has been driving me crazy for a while, since we moved in I think. X and I arrived here a few weeks before my husband returned from deployment. I unpacked what I could, but that wasn’t much. Then he got home and who wants to unpack when you haven’t seen each other for almost a year?!? Not us, apparently. Honestly for the first 3 months our living room was a labyrinth of boxes and most of our furniture was still in storage. X and I spent most of our days outside. Eventually we did get our furniture out of storage and looked through all of the boxes. a LOT of which went back in storage. We moved from a 4 bedroom house to a 2 bedroom apartment and all of our stuff sat in storage for a year while X and I lived with family. Most of our stuff wouldn’t fit in this apartment. A lot of it I didn’t pack myself and I haven’t seen it for a year. I was not up for the task of truly sorting through everything and getting rid of what we didn’t need. So we pay for a storage unit of crap we haven’t touched in a year and a half. Some day I will tackle the storage unit. But first I needed to beat our home into submission. I needed to tame the clutter. Our house is clean- I spend hours a day, cleaning. But X is a very active toddler who only sometimes likes to pick up his toys and my husband cleans up after himself less then my toddler does. Add to that the sediment of stuff that doesn’t have a home and just piles up in random places, and Houston, we have a problem. First I needed to organize X’s toy closet. I rotate his toys and have lots of arts and crafts supplies that just kind of exploded all over the largest closet in our apartment. Once organized I had room to work with! Second I packed away things we don’t use. A printer that may not work, and extra computer monitor, the toaster we never use… The list goes on. Once those were gone I eliminated or repurposed the furniture that stuff was siting on. Less open surfaces mean less area to collect clutter, right? I hope so! Maybe if my husband doesn’t have anywhere to put random things and trash down, he won’t? A woman can hope. 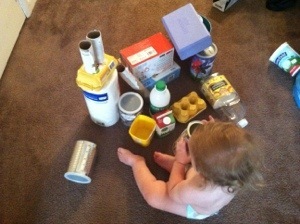 Then all the existing clutter needed to find a home. Honestly there is a box in the closet of stuff we don’t use regularly but I didn’t want to throw out or give away. I will deal with this at a later date. Honestly I just need a clean, clutter free environment so my brain can unclutter a little as well. I’ve made some great progress. I need a few storage and container items to help organize and I need to truly tackle all of the stuff in storage and that’s stored away in closets. But one step at a time. How do you cut down on clutter and keep your home organized? Before I was a mom my house was spotless and meticulously decorated. I baked bread, I made gourmet desserts. I threw dinner and brunch and Christmas parties. I wore makeup, I accessorized; darn, who are we kidding, I got dressed every day. These things mattered to me. It’s amazing how quickly priorities change, whether by choice or by force. Now, my house is clean but cluttered. There is always a toy to be tripped over or creatively placed clean diapers strewn across the floor (do all kids love throwing their clean diapers around?). I work hard to get a healthy dinner on the table and trust me, it’s not gourmet. If company comes over I repeatedly apologize for my house being messy and the thought of having more then 2 people over at once, throws me into a panic. Some days yoga pants and the t shirt I wore yesterday is the best I can do. Up until recently, I’ve struggled with this shift. I’ve always managed my time well and completed tasks quickly. I assumed I would be one of those moms who was immaculately dressed with makeup and baby in a homemade bow tie. That I would still have time to throw parties and make desserts and make cute craft projects in my spare time. But I’m not. X has always been a high needs kid. For the first 3 months he would only sleep if he was on top of me. After that he would only sleep if I was next to him. Baby cuddles and iphone games became a way of life for me. Now, he untidies our home more quickly then I tidy it. He likes to have me sit near him or engage with him while he plays. 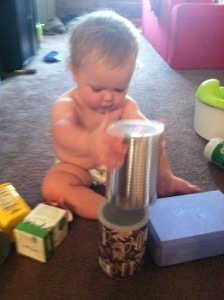 My priorities now center around creating stimulating, skill building, Montessori based activities for him. Making sure he’s getting the very best food I can serve him. Simple, comfortable clothes are his wardrobe; they allow him to play and if they get muddy or covered in finger paint, I don’t care. In fact, the same goes for me. Simple and comfortable is my wardrobe as well because I’m chasing him around the playground and yogurt or almond butter invariably gets wiped on me at some point through out the day. Engaging him and his interests, spending quality time together and showing him the world are now my priorities. And to accomplish those, I need to let go of my previous priorities, and that’s ok. He’s a happy, well fed, smart, energetic, loving, curious, outgoing, beautiful child. And that is the best thing I could ever hope to accomplish. But I need to remember myself, too. Doing things I love and relaxing are important too. I can’t completely loose myself and expect to be the best mom, wife and woman I can be. I forget this often. It’s ok to drink a cup of coffee and read a good book while X is napping. The dishes will still be there later, I can take a few moments to draw or sew or create in the few hours a day I have to myself. It’s ok to take a nap during the day when we’ve had back to back to back nights where X wakes every 15 minutes. WE are more important then a spotless home or fresh baked bread. 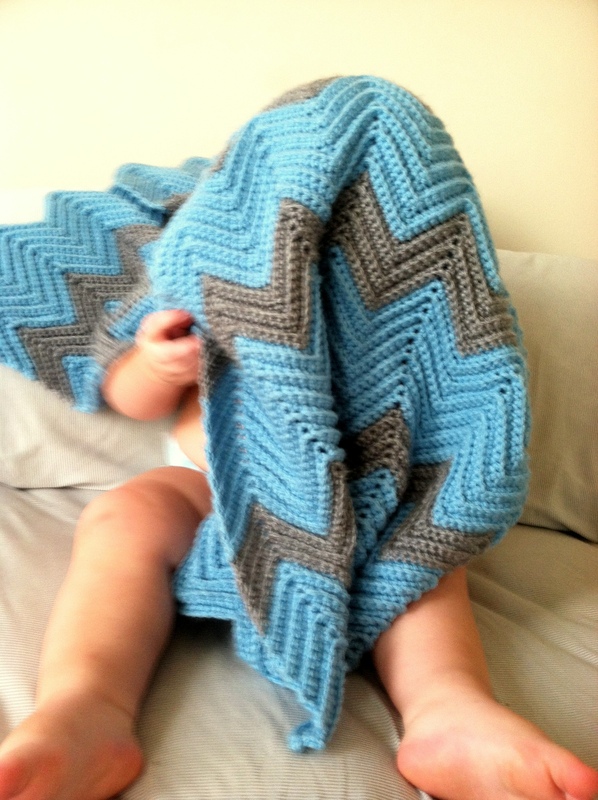 And sometimes, a game of peek-a-boo under a blanket, is the most important thing in the world I could be doing. Every parent dreads it, teething. Seeing our little ones in pain and not being able to stop it or even explain why it’s happening is heart breaking. Plus sleepless nights and fussy babies can be exhausting. X started early and has gone full force. His front 2 bottom teeth broke through at 4 months. His 4 front top teeth all cut at the same time around 6 months. He’s been a champ, he really has. But I discovered a few tips and tricks so far. First of all, thank goodness for clove oil!! I made my own teething oil and it works so well. Mix well and try on your gums first. Straight clove oil burns and different brands may have different potency, so always try it on yourself first. I stored it in a little bottle and used a clean q-tip to apply it as needed. Clove has pain relieving and antiseptic properties. X realizes it helps and opens his mouth whenever I pick up the bottle. Secondly, we used a Baltic Amber teething necklace. As your body warms the amber, it releases an oil that is calming and helps relieve pain. 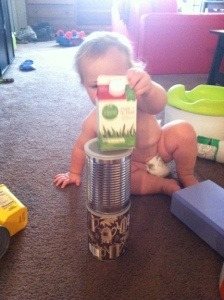 I purchased mine through Momma Bean Stalk and we love it. She does a beautiful job and knots between each piece of amber, so if it breaks you don’t loose the whole strand. It makes a HUGE difference. We misplaced it for a few days and I was ready to buy another. Lastly I bought him this teether which is amazing. He uses it non stop when he’s cutting new teeth. After learning about the dangers of oral numbing gels for babies I avoided any similar products. The FDA explains the dangers here. Also numbing agents can be swallowed, numbing the throat and potentially causing choking and breathing issues. Not worth the risk in my book. We made it to Maine! Well, we made it to Maine a while back, but settling in has taken some time. The drive went better then I expected. X slept most of each 12 hour travel day. Apparently his limit on travel is 11 hours and 40 minutes though because both days he cried for the last 20 minutes. Luckily we were able to stop in Baltimore and stay with family, which was almost exactly half way. I stopped 3 times each day, X needing to eat and the car needing gas seemed to coincide nicely. The pets did well also. My poor pup sleeps sprawled out but was only allotted the front passenger seat (as every other nook and cranny was stuffed with shoes or baby gear) and thus was never really able to settle in. I’m pretty sure he slept for 2 days straight once we arrived in Maine. I managed to pack fairly well, having plenty of diapers and wipes, snacks, water, etc easily accessible. My big mistake was not packing a baby carrier that I could get too. Going to the bathroom in a truck stop while holding an 18 lb infant was a skill I never dreamed I would master. Baby X has 3, yes count them 3, teeth coming in. Go big or go home I suppose! 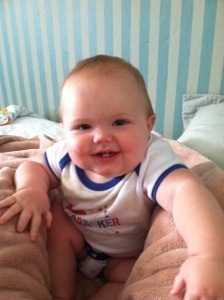 Today also marks his 4 month birthday which of course means a check up and immunizations. Add a 22 hour drive to our horizon and you’ve got what will be the most difficult 2 days of X’s life so far. Luckily we have family in Baltimore which is exactly halfway, so we’ll be making a pit stop and breaking the drive into 2 days. Thank goodness because with a car full of stuff and a dog and a cat, I’m not sure we’d make it in one piece otherwise! In positive happenings we’ll get too meet X’s cousin baby M who is just 2 weeks old! I’m excited for him to meet another baby now that he’s more aware of what’s going on. It should be fun for them to grow up so close in age. Every little boy needs a younger (even if only slightly) little girl to watch out for. The last few weeks have been filled with stress, packing, running a million errands and not a lot of sleep; for any of us. 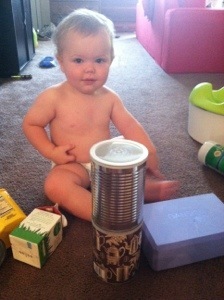 I’m hoping once we get to Maine I can create a little more stability and routine for X then the last month has allowed. His momma thrives on routine and I’m pretty sure this little one does as well. Wish us luck! I’ll be sure to post the many lessons learned from traveling with an infant.